Why shape wasabi like a sea creature? Because shaping it like a sushi roll won’t be that original now would it? Besides, making a tasty roll is only half the job, you gotta make it look good. Of course there are many ways to make your sushi plate look a bit more original and attractive, but none of these come even close to serving sushi you made along with an octopus made from nothing else but wasabi. none. How do you make wasabi octopus for sushi?! Step 1 – Begin by taking a small round piece of wasabi, and start rolling it against the surface to create a finger like shape. This should be a small piece of wasabi, about half a spoon. Step 2 – Take a pen you have hanging around, preferably a new pen, and remove it’s ink container. Use the pen tip to make little holes on the wasabi – to imitate the octopus’ suction cups. Step 3 – You should make a few of those octopus legs, eight if you want to be precise. Trust me, in every sushi party there must be a guy to ask why the octopus has only seven legs so, either make it eight or find a good answer for it. Maybe “the rest of his legs are in the sushi” can work once or twice. Well. Now that the legs are done all that is left is the body. Take a bigger piece of wasabi and round it into a ballish shape only that top should be bigger than the base like in a real octopus. Put it all together and voila! 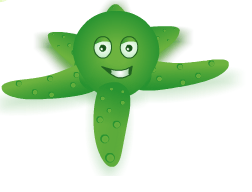 Step 4 – Feel free to make your wasabi octopus your own personal and exciting sushi gimmick, and don’t forget to post a picture of it on our forums.